Sean is very modest, not prone to bragging about how strong-willed he is. He’d as soon enjoy a good long chat with a neighbour or friend as anything else. But those who know him might say he’s got “chutzpah.” He’s one very determined young man. It seems that large and very noisy machinery really grabs and holds Sean’s interest. What might intimidate even the strongest of heart presents a delicious challenge to him. Large machinery seems to be a magnet, drawing him in and lighting him up. Summer can’t come soon enough for Sean, who cannot wait to attend the tractor pulls. The noise of “suped up” tractors is no deterrent – it’s just part of the excitement. He is so enamoured with the sport that he has determined to meet some of the sport’s celebrities, such as Ken Austin, who once posed with Sean in a treasured photo. But being a spectator is not always enough for Sean. An experience in the driver’s seat of a swing hoe has him dreaming of a day when he might get to operate one of these amazing machines, on his own. Granted, he might want to start out with a mini excavator, to fine tune his safety and operational skills, but he definitely sees control levers and a bucket somewhere in his future. In the meantime, Sean can be seen, during the summer, cutting the grass, at his father’s place. Some might find the task onerous, but Sean is right where he wants to be. 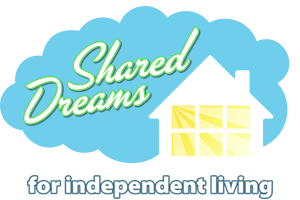 Passersby will honk and wave, and some will even stop for a chat – Sean might share the latest news about what he’s been up to with his garden, or, perhaps, his latest escapades as goalie for his floor hockey team. 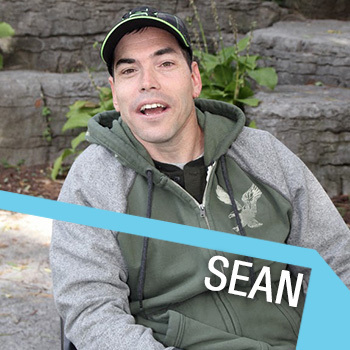 One thing is for sure – Sean does not allow any physical barrier stop him from achieving his goals. He knows what he wants, and he’s determined to be in charge of his future. If past history is any indication, that future is sure to include equipment, motors and lots of noise.